The holidays are upon us and it’s time to start decking your halls! Here at Vintage Tub & Bath, we’re excited to offer an extensive line of National Tree Company Christmas Trees, wreaths, and garland to help you decorate your home this holiday season. Not only does National Tree Company offer the best selection of the most realistic looking artificial Christmas trees, they’re also at the forefront of innovation. Many of their products offer features that are exclusive to the National Tree Company brand. Feel Real® Tip Technology – Products with Feel Real® Tip Technology have crush-resistant polyethylene tips, which give the trees and greenery a more realistic look and feel. Dual Color® Lights – These products have low voltage LED bulbs, which change from a warm white to multicolored. They also include a switch that controls nine different light functions. PowerConnect™ - Sick and tired of dealing with multiple strings of lights and extension cords? With PowerConnect™ you don’t have to. These trees have electrical connections through the tree’s center poles. 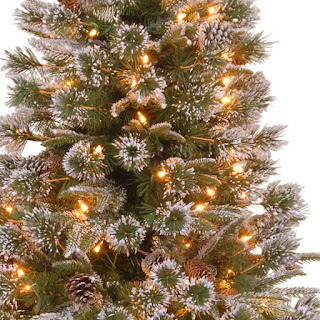 Oh, did we forget to mention, we have over 25 tree and greenery types to choose from? Whether you have your heart set on a Douglas fir or you’re dreaming of finding the perfect blue spruce, we guarantee you’ll find the perfect Christmas tree for your home at Vintage Tub & Bath.